The Spornet (ワタオトシバチ?, lit. : "Cotton Dropping Bee") is an enemy found in Hey! Pikmin. It is a small flying insectoid creature with a large, glowing abdomen. It has a yellow face and blue body with two small antennae and big red eyes. 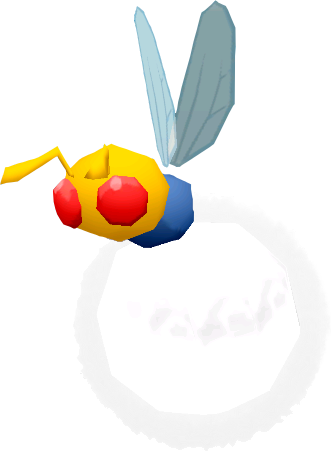 It attacks by hovering in the sky with its bee-like wings, and dropping toxic spores on Captain Olimar and Pikmin. To do: Retrieve its heath value from the game files. Spornets fly in a set path, and will only deviate if they spot Pikmin. Once they spot a target, they will drop a purple-colored fuzzball that will fall to the floor. If any Pikmin touch this, or are caught underneath this when it lands, they will be killed. If they lose sight of their target, they will resume their patrol. Spornets do not drop any Sparklium when killed. Cavern of Confusion: Spornets are found very commonly throughout this level. They are almost always flying very high in the sky, so the Yellow Pikmin that are provided are needed to attack it. The Hollow Sky: They appear here as an extra enemy to be mindful of, along with Crumbugs. They alone as well as their projectiles make the level more difficult. Pollution Pool: They only appear briefly near the end of the level, close to the bridge that must be built. They act as an obstacle that the player must be careful of while their Blue Pikmin build the bridge. They can be killed, but it is however difficult because the player can't bring Yellow Pikmin until the bridge is built. Fragrant Forest: Several Spornets are also found throughout this area. About halfway through the level, there is an open room with two doorways in the area's "backside". Next to each of the doorways is a Spornet. Two more appear in the section after the player goes through the doorway. These are a bit trickier to defeat, since they are higher and above a stick. The final one is close to a vine leading to the Ominous Vault. Gale-Force Glen: Spornets appear quite commonly in this level. There are small groups of about two scattered across the area, usually above sticks and leaf platforms. They are relatively easy to defeat, since the level supplies the player with Winged Pikmin and not too many appear at once. Spornets can be taken out with a single Pikmin throw. They are often found high above the ground, and are best dealt with using Yellow Pikmin. Although groups of them can be overwhelming, killing one will immediately destroy its spore, if it's currently falling. With good aim, you can kill the Spornet before the Pikmin hits the spore. To do: Add the Japanese name's description, and move the family naming info to fuzzbuzz family. The Spornet’s name is a portmanteau of the words "spore" and "hornet". The spore part of its name comes from its purple spore-like projectiles, and the hornet part of its name is due to the fact they resemble hornets. Additionally, the family name "Fuzzbuzz" is a portmanteau of fuzz (referring to the Spornet’s fuzzy abdomen), and buzz (referring to the sound a bee, or hornet makes). A Spornet dropping a fuzzball in a cutscene in the Cavern of Confusion. This page was last edited on January 27, 2019, at 12:13.